CARMEL, Calif. – August 2018 – Award-winning sculptor Richard Pietruska will present three original works at the Automotive Fine Arts Society exhibit during the Pebble Beach Concours d ’Elegance on Sunday, August 26th in Carmel, California. One of his pieces celebrates the legendary Porsche 917K and commemorates the announcement 50 years ago of the racing category that it dominated at Le Mans. The Lincoln Motor Company will sponsor the AFAS exhibit on the Pebble Beach show field for the 21st year. 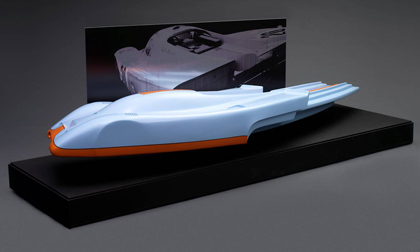 The fiberglass sculpture is 6’ long by 22’ wide and features the iconic Gulf racing colors. The piece is highly stylized and curved, showing both speed and motion. There is also a photo of the 917K etched on aluminum behind the sculpture, adding another dimension to the work. Richard Pietruska’s career as an automotive designer began early, winning the Fisher Body Craftsman Guild, which led to a scholarship to study at the Art Center College of Design in Pasadena. There he received both a Bachelor of Science Degree in Automotive Design and a Masters of Fine Arts degree. With a background in various media – from paint to tapestries – his focus is on automotive sculpture, using techniques ranging from bronze casting to cast resin and fiberglass, stainless steel and plastics. His sculptures exhibit the dynamic fluid motion of the automobile, while simplifying the basic design lines of some of the most exotic vehicles of the past and present. His work has been featured in various magazines, including Road & Track, Automobile Magazine, The Robb Report, Pilota, Octane Magazine and Garage Magazine. He is also one of the few automotive sculptors to have been chosen to do the artwork for the Meadow Brook Concours d’Elegance poster. In addition, Pietruska has designed awards and trophies for many automotive events, including the Car of the Year Award for Automobile Magazine, the Cranbrook Concours d’Elegance, the Petersen Museum and the Newport Beach Concours d’Elegance. For more information on Richard Pietruska art, visit his website.